Your health is worth more than a bulk multivitamin pill. You deserve Reliv Now. Made with LunaRich, Reliv's epigenetic superfood, and loaded with vitamins, minerals and super-powered antioxidants, Reliv Now is built on the latest findings in nutrition science. Its uniquely effective formula delivers a balanced array of the most advanced ingredients to give your body what it needs to thrive. Why settle for ‘fine’ when you can feel ‘great!’? Get your health up to speed with Reliv Now. Cutting-Edge Science: Study shows potential of Reliv Now® + LunaRich X to support weight loss, heart health and metabolic wellness. 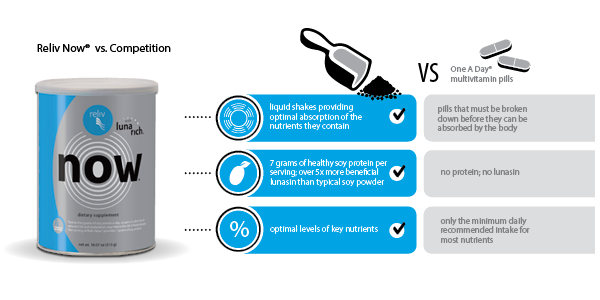 Reliv’s exclusive LunaRich™ soy powder… …you’ve discovered the world’s first supplement to contain this cutting-edge nutritional breakthrough, scientifically designed to maximize soy’s documented health benefits. Pycnogenol®… …you benefit from a natural super antioxidant, proven to help fight free radical damage, improve blood circulation and lower blood glucose, among other benefits. New study shows Reliv Now® and FibRestore® may help with lowering risk factors for cardiovascular disease. Reliv’s scientific approach to optimal nutrition offers much more than you can find in any ordinary multivitamin pill or nutrition shake on the market. 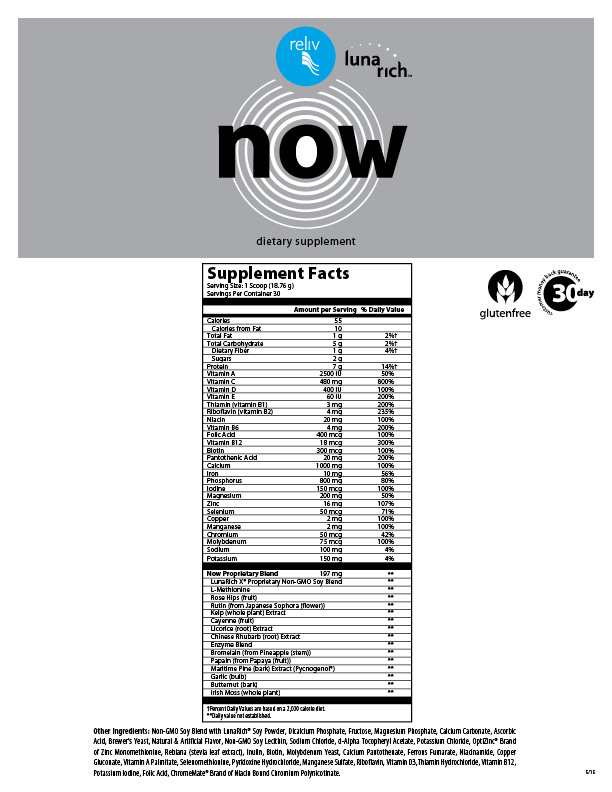 We challenge you to find a better daily nutritional supplement on any store shelf! Discover the unique blend of ingredients that makes Reliv Now unlike any other nutritional supplement available today.